Dupilumab (brand name Dupixent) is shaping up to be a game-changer in the treatment of atopic dermatitis, often referred to informally as “eczema”. Dupixent addresses an underlying immune dysregulation that contributes to the development of atopic dermatitis. It blocks IL-4 and IL-13, two important cytokines in the TH2 pathway. 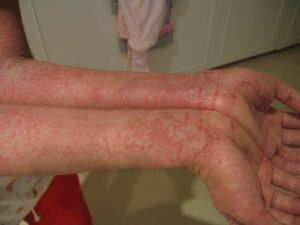 In a clinical trial, after 12 weeks of Dupixent monotherapy, 85% of treated patients had at least a 50% reduction in eczema severity, and 40% were clear or almost clear. Dupixent is an injectable medication. It should be used with topical medications such as corticosteroids as needed. Of note is a side-effect of conjunctivitis observed in about 10% of patients. In clinical use, this can be managed by collaborating with an ophthalmologist, and may require corticosteroid drops. Lubricating eye drops at the start of treatment may help prevent this side-effect. It should also be noted that Dupixent is approved for use in adults, and trials for FDA-approval in pediatric populations have not yet been completed. For patients with difficult-to-treat atopic dermatitis, especially those that have been on systemic drugs such as cyclosporine, methotrexate, azathioprine, prednisone, and mycophenolate mofetil, Dupixent is a very welcome addition to the atopic dermatitis arsenal.